aki is using Smore newsletters to spread the word online. Do you want a job? Do you want to go to your dream college? Even if you are a top student in your school, texting can affect you. Then don’t text a lot. Texting is the main cause of people getting rejected during their applications for jobs. 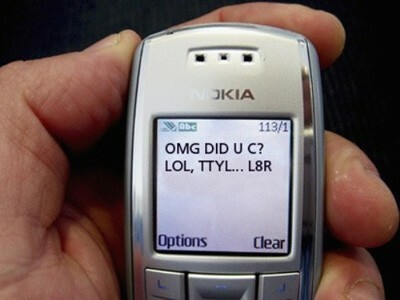 A vast majority of people who text, mess-up on their writing skills. These people usually use shortcuts while texting, which might reflect in their applications, essays, etc. they will be needing to do in their daily life. Texting can influence your writing habits on a big scale. It is the main cause of writing errors but there is a way to solve this upcoming problem. 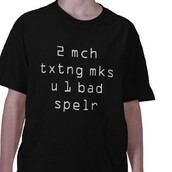 Texting can be one of the main causes of spelling and grammar mistakes. There are many reasons, one of them is that many people are too lazy to type the whole word, and tend to use shortcuts, like “ur” instead of “your” and “u” instead of “you”. This is what most teens do. There are many real world examples, like the woman in her twenties, who got rejected for a job due to her shortcuts, grammar, and spelling mistakes which looked like texting in her job application(Alessandra Potenza). Tagliamonte is another victim of texting. She sees her language is slowly getting influenced because of her texting habits(Jane Solomon, in blog dictionary). As of January 2014, 90% of the American adults own a cell phone and 64% of Americans own a smartphone in October 2014( Pewresearchorg). This means that most of the Americans may be texting. 64 percent of teens used informal writing or texting style in their schoolwork(Alessandra Potenza).This shows the number of people, who already have been affected by texting. Teachers say “the informal language is showing up more and more in class.” “IM-ing language...has become part of what [students] think is the standard vocabulary, says Karra Shimabukuro”(Alessandra Potenza).This is a proof from the teachers who are grieving about this problem. Some people think that texting is not the cause of spelling or grammar mistakes, but it can be the laziness of a person who is texting. Also Autocorrect is affecting people these days because the text will be corrected by the program and the person who is texting doesn't even know or care about it. This problem also affects me in writing sometimes. Texting and Autocorrect are slowly affecting me. These days I feel some of my words are slowly getting influenced by texting, like once I wrote “dont” instead of don’t. And the auto correct always fixes me. And probably these types of mistakes are happening to everyone. In the future, this can be a really big problem for me and everyone in the world. And the people should find their way or just look at others people’s solutions for this problem like mine in the following paragraph below. I really want to go to my dream college and get a good job, so I need ways to resolve this! There are a couple of ways to solve this problem. One method is to try hard and use complete sentences that are grammatically correct with accurate spellings while texting. Another method is to disable autocorrect while writing that will force the person to pay more attention to grammatical and spelling mistakes. Another choice would be to reduce texting and choosing to call that would prevent bad writing habits to set in. If people can follow these, they would find better results in their writing pieces and job applications. These days our English language is slowly being affected by texting and we are making grammatical and spelling mistakes and there are solutions for these problems. If people consciously attempt to follow some methods suggested in this essay, there could be a big improvement in their writing pieces and job applications. If you follow these simple methods you are bound to reach greater heights in your career! Solomon, Jane. "Is Text Messaging Ruining English? | Dictionary.com Blog." Dictionarycom Blog. N.p., 05 Nov. 2013. Web. 17 Dec. 2015. <http://blog.dictionary.com/shortening-english/>. Raine, Lee, and Scott Keeter. "Americans and Their Cell Phones." Pew Research Center Internet Science Tech RSS. N.p., 02 Apr. 2006. Web. 17 Dec. 2015. <http://www.pewinternet.org/2006/04/03/americans-and-their-cell-phones-2/>.